Was Rio Olympics unsuccessful for team Lithuania? Team Lithuania did not bring home any gold medals from the Rio de Janeiro Olympic Games, disappointing many fans, but achieved top results in events few had been investing much hope into before. Everyone in Lithuania expected the country's swimming star, 19-year-old Rūta Meilutytė to repeat her golden feat from London Olympics. Although Rūta made it to the 100m breaststroke finals, she finished seventh. Another London champion, pentathlete Laura Asadauskaitė, saw her Olympic hopes shatter when her horse refused to jump over obstacles in the show jumping event of the competition. Although Laura triumphed in the combined shooting and cross-country running event, achieving an Olympic record, that was not enough to put her back at the top. The men's basketball team was probably under the biggest pressure to succeed. The Lithuanian team successfully advanced to the quarter-finals, but were eliminated after a loss to Australia. On the other hand, Lithuanian athletes won medals in events few had much expectation from. Rowers Mindaugas Griškonis and Saulius Ritter won silver and three bronze medals were awarded to the rowing duo of Milda Valčiukaitė and Donata Vištartaitė, the pair of canoeists Aurimas Lankas and Edvinas Ramanauskas, and weightlifter Aurimas Didžbalis. With one silver and three bronze medals, Lithuania ranked 64th in the medal table of participating nations, a significant drop from the 34th position in London. However, was not the worst games for Lithuania which rejoined the Olympic movement in Barcelona in 1992. In the 1996 Atlanata Games, Lithuania ranked 71st with one bronze medal. In 2008 in Beijing, Lithuanian athletes did not win any gold medals either (two silver and three bronze medals put the country in the 56th position). 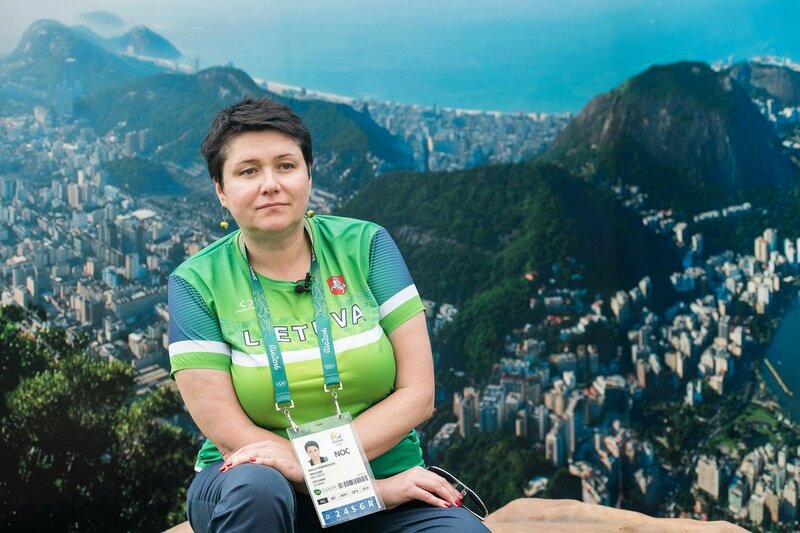 Daina Gudzinevičiūtė, the president of Lithuania's National Olympic Committee and herself an Olympic champion in Sydney in 2000, says that while not all expectations were met in Rio, team Lithuania did quite well. What were Team Lithuania's expectations before the Olympics and how do they feel after the games? The feeling is good. We are happy with the performances of our athletes. We achieved a great deal. We have won four medals. They may not be the colour we had hoped for. When it comes to expectations, yes, we had two Olympic champions [swimmer Rūta Meilutytė and pentathlete Laura Asadauskaitė] who we hoped would defend their titles. Unfortunately, that didn't happen. It's not a tragedy, these are young athletes, they have their careers ahead of them. There is some disappointment for them and for their fans, though. Not all of our hopes were realized. Athletes we expected medals from didn't succeed, but those who did win them were the ones we had spoken least about. What is it down to? Psychological preparation? It's the Olympics, everyone comes prepared. Everyone hopes to show the best they've got. Our athletes with previous titles hoped for and did everything they could [to win], but, as you say, psychological preparation plays a big role, as does pressure to live up to their previous achievements. That pressure is huge. It was different for each of these athletes, Rūta Meilutytė and Laura Asadauskaitė. Laura's performance [in modern pentathlon] was indeed great. The way she finished, fully aware that she would not win a high position, only shows once again that an athlete is a warrior who must fight until the very end. The entire nation was watching the matches of our basketball team. They did not do that well, the performances in the last three games were quite underwhelming, but let's not rush to judgement. There are all kinds of circumstances. How did the games themselves go? Were you happy with the organization? An event of this scale cannot go without any small misunderstandings. We like to blow these small incidents out of proportion, to revel in any scheduling issue, when a bus fails to come or an event is late to start. I do not recall a single Olypics without such incidents - and trust me, I've been to many. So small incidents notwithstanding, the Games went well, without any major failings. There's always the human factor involved. As you know, there were scandals about referees, some misunderstandings with the course of some events, but in general, it has been a great Olympics, people were benevolent, a lot of volunteers. Security, which had been number-one issue before the games, was ensured. Despite some minor incidents, we felt safe in the city.